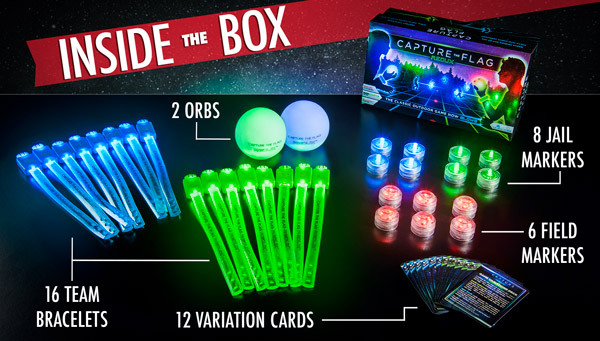 Capture the Flag Redux: Play glow in the dark capture the flag! Outdoor games don’t have to stop when the sun goes down. 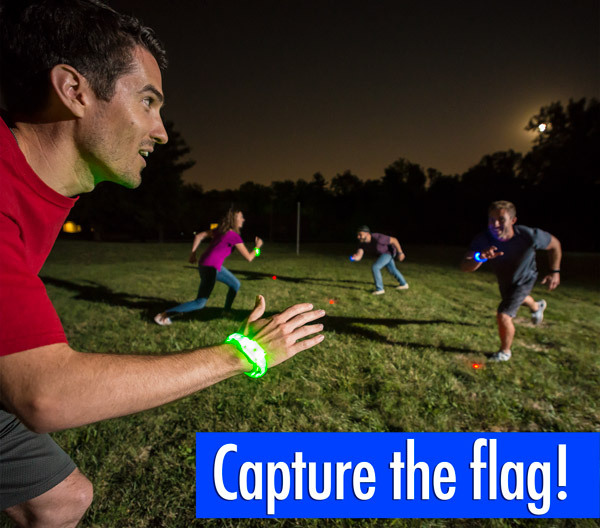 Play Capture the Flag Redux and keep the fun going well after the streetlights turn on. 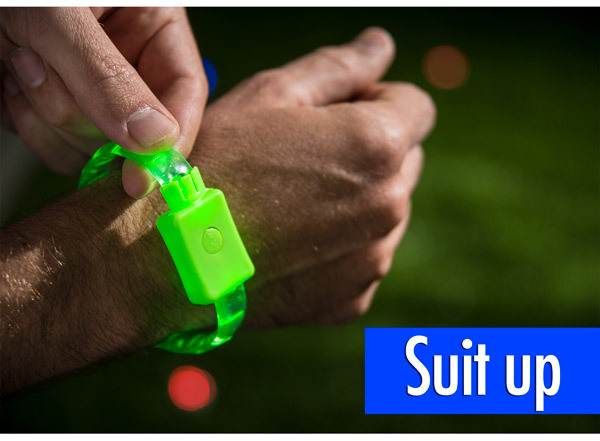 This glowing update to the summer camp favorite uses LED lights to let you play under the cover of darkness. The traditional flags are replaced with glowing orbs while colored LED bracelets let you easily discern friend from foe—and prevent you from crashing into either. 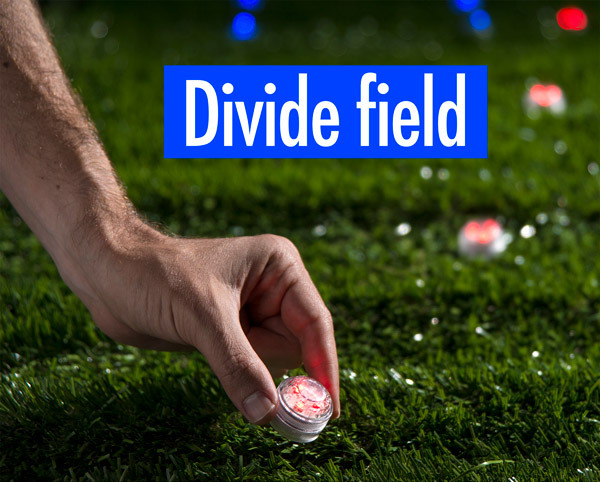 Use the included LED marker lights to create each team’s territory and jails, and then let the game commence. Playing at night adds a new level of fun and intrigue to a game that’s been popular since around the time flags were invented. It seems that as long as there’s been summer (or camp counselors looking for stuff to do with the kids), there’s been capture the flag. Capture the Flag Redux updates the game to make it easier to play (and a heck of a lot cooler)! The glowing game pieces help you play safely at night while also adding a futuristic feel to the age-old activity. The LED bracelets have three different light-up modes so you can choose your level of stealth as you sneak around in the dark. Just as fun as you remember. The game may look different, but the objective in Capture the Flag Redux hasn’t changed: return with the other team’s flag to your territory to win. 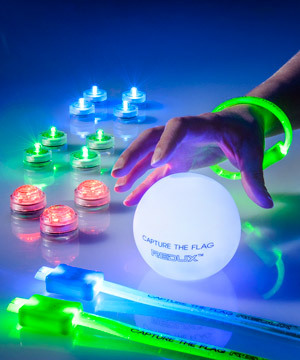 Start by putting on your team’s colored LED bracelet and hiding your team’s colored orb (which acts as a flag). Mark your territory boundary with the red lights, knowing that once you cross that line the other team can tag you to put you in jail. Your teammates can spring you from jail by slapping your hand, but they’ll need to look out for the other team’s guards. If you can sneak, evade, and run your way behind enemy lines, you can bring the other team’s flag back to your territory for the win! These colors do run (when chased). The Capture the Flag Redux set includes a dozen game variation cards with alternate rules to add to the fun. Each card includes a concise summary of the altered rules and an illustration depicting how you’ll feel while playing. 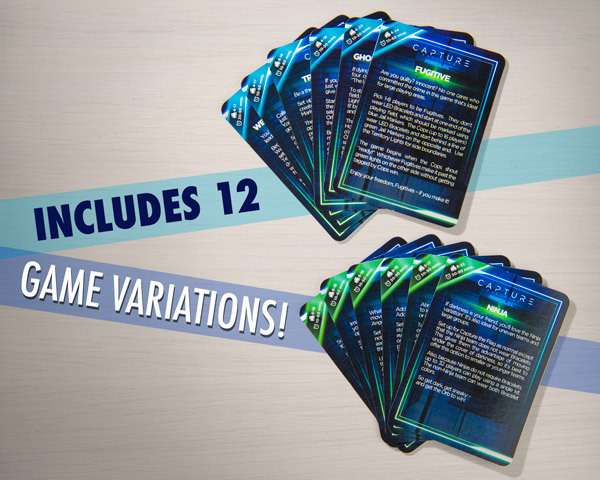 In addition to keeping your games fresh, the cards also help accommodate different player, time, and field constraints. Younger players will enjoy being ninjas, with the added advantage of not wearing LED bracelets; those looking for a quicker game will enjoy setting up ghosts in the graveyard, where the living try to find the hiding ghost players; and if your playing area is low on hiding spots, assign a “president” to carry your orb instead of hiding it. Pick a game, any game. 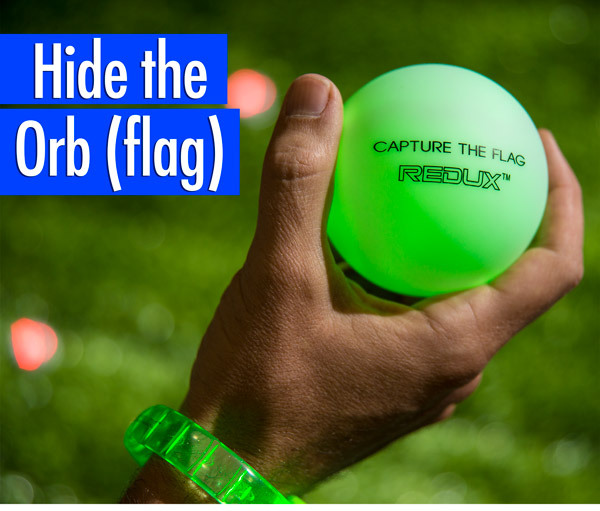 Capture the Flag Redux includes everything you need for a night of fun. 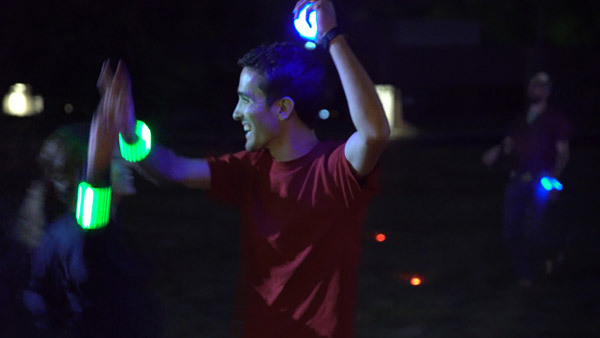 With 16 LED bracelets in two different colors, you can get the whole neighborhood playing (even the smelly kid). The clear delineations provided by the field and jail markers mean you don’t have to rely on confusing boundaries like that tree over there… the brown one… no the other brown one. Question: How many people can play at once? Answer: Capture the Flag Redux has enough bracelets to allow for two teams of eight people. Additionally, there are suggestions for rules variations that don’t require bracelets which can expand your roster even more. Question: Can you play this inside? Answer: You can play Capture the Flag Redux indoors, but you’ll want to make sure you have a large enough area for players to safely run around (especially if the lights are off).